Home » A German scholar and a citizen. A German citizen and a scholar. 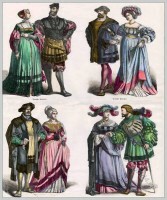 German Renaissance clothing in 1530. 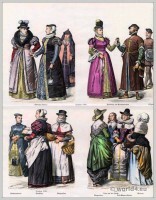 Exampel of German fashion at the time of the Renaissance and Reformation 16th century. 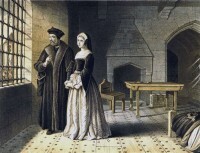 Clothing in 1530. A German citizen and a scholar. The clothing in this period was characterized by the expression of the dignity and freedom of movement. The scholar wearing a sleeveless Schaube, underscoring his gentility. The Schaube was a shell-shaped cape. Depending on the status of the citizen, in the length varied and was often surrounded at the edges with fur. The dress of the woman has a small square neckline emerges through the tunic. Often the neckline of the dress was decorated with ruffles. The sleeves are cut closely and extend to the hands. On her head she wears a Calotte. Men-at-arms with lances. 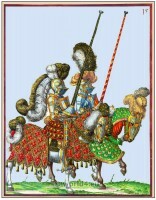 16th century soldiers. 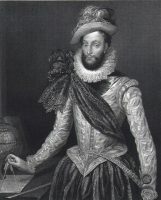 Baroque fashion of the late 16th century. 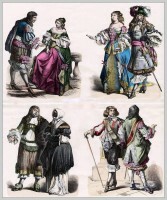 French and Dutch Costumes. Medieval female hats and hairstyles of the 15th and 16th centuries. This entry was posted in 1530, 16th Century, Germany, Renaissance and tagged Calotte, Pourpoint, Renaissance fashion era, Schaube, Schecke on 3/17/13 by world4.